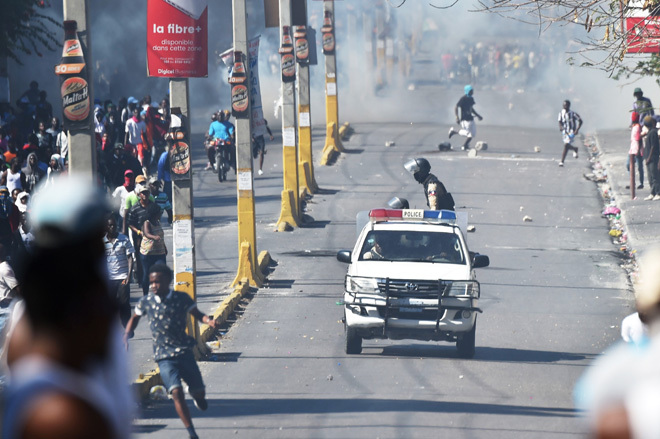 The normally traffic-clogged streets were largely empty as schools, shops and municipal offices were shuttered for fear of more violence that has already left several people dead and an air of uncertainty hanging over the government of President Jovenel Moise. Barricades have sprung up in some areas of the capital and other cities, as protesters have taken to the streets demanding the president step down over reports of mismanagement and possible embezzlement of development funds in the impoverished Caribbean nation. Since the opposition organised widespread demonstrations last week to mark two years of Moise’s presidency, smaller and more spontaneous protests have broken out in key urban centers. “We don’t have good leaders: if there was work in the country, this would never have happened,” he said. Later on, private sector associations deplored what they described as “legitimate popular anger that is unfortunately wrongly directed to companies that create jobs,” and called for political dialogue. Investigations have shown that nearly US$2 billion from the programme were misused. During his election campaign, Moise promised ‘food on every plate and money in every pocket’, yet most Haitians still struggle to make ends meet and face inflation that has risen 15 per cent since his election. A mediation group composed of a senior UN official, the ambassadors of Brazil, Canada, France, Germany and the United States, and representatives of Spain, the EU and the Organisation of American States, has called on Haiti’s politicians to enter dialogue over the crisis, lamenting the loss of life and damage caused by the protests.